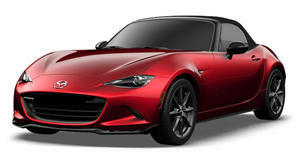 As the world’s best-selling roadster, the Mazda MX-5 Miata is a very common sight. Rare examples of the much-loved Japanese sports car do exist, however. Take this 2004 Mazda MX-5 Miata Roadster Coupe Type S, for example, which is currently listed for sale on Pistonheads. To put it simply, you’re looking at one of the rarest Mazdas ever made. Originally made for the Japanese market, this coupe version of the Mazda MX-5 Miata was the result of a collaboration between Mazda and its Engineering and Technology team in 2003. Only 179 were made, but this example for sale is even rarer. That’s because it’s one of 63 Type S models, which packs a 1.8-liter engine that produces 158 hp and is hooked up to a six-speed manual gearbox. Two other trims were also powered by the 1.8-liter unit, and the base model used a 1.6-liter engine. Compared to the soft top version, the MX-5 Miata Coupe boasts improved driving dynamics since its metal roof improves chassis rigidity and reduces drag, despite adding 22 pounds to the car’s overall weight. The car listed for sale has also received a comprehensive restoration including a fresh paint finish and numerous new parts inside and out. A full service history is included along with documented restoration work. Mechanically, the listing claims the car "works like a dream” and the engine and gearbox are said to be "as strong as ever.” With only 30,000 miles, tracking down an example in better condition than this probably won’t be easy. If you want to own it, the car is based in Hong Kong but can be shipped worldwide. It’s currently listed for HK$298,000 (around $38,000). There’s a good chance this will become one of the most sought-after Mazdas for collectors so its value could increase over time, which could make this a smart investment.